Above postcard, date unknown. Kindly sent by Ivan Rossiter. However, number 49 today shows the building central. The one on the left looks similar to the old postcard above as well. But that too doesn't look quite right. Although looking at the picture perhaps the left of the building has been added to. Further local knowledge needed here I fear. 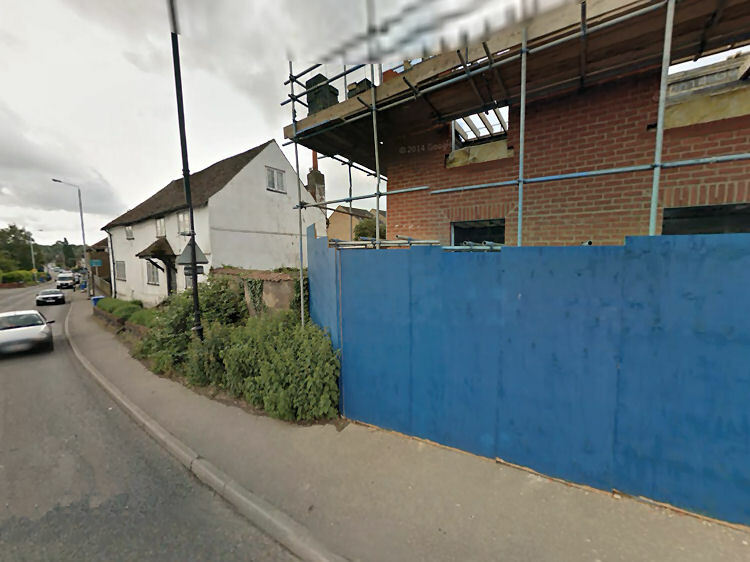 Ivan Rossiter has kindly pointed me in the right direction and the above image from Google May 2014, shows the location of the original "George Inn," before the "Sir John Falstaff" was renamed. 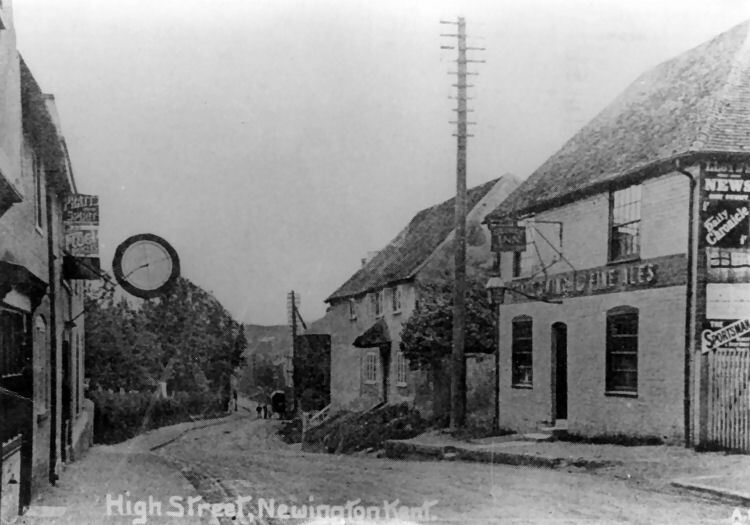 The High Street, Newington, featuring the "Sir John Falstaff" pub, which villagers will remember as being the "George." First built in 1603, the building acquired its first alehouse licence in 1763 and was then known as the "Sir John Falstaff." In 1912 the innkeeper of the "George" that stood across the road from the "Sir John Falstaff," sounded the alarm that his inn was on fire. Such was the damage to the building he was forced to cease trading. The owners of the inn at that time were the brewers, Style and Winch, who also owned the "Falstaff," so they sold the site of the old "George" and renamed the "Falstaff" the "George." Since being an inn, the old "George" has been a basket maker's workshop, a fire station, a wartime restaurant for the troops and today (2014) is an engraver's workshop. TROUBLED PUBLIC HOUSE IN NEWINGTON. 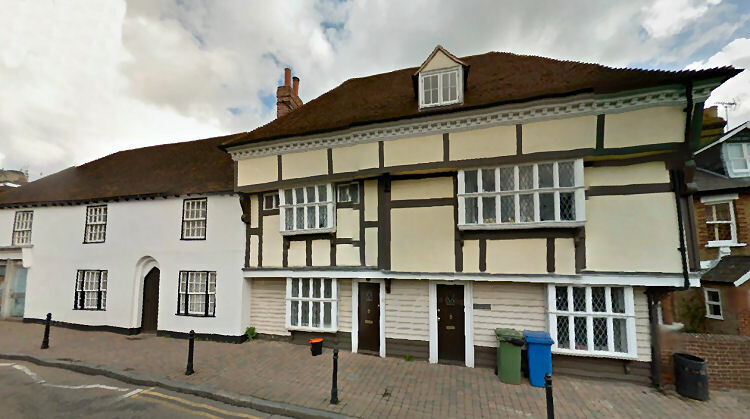 For decades leading up to 1900, a strange story was told by many local folk of the "George Inn" in Newington, Kent. It has been passed down through generations and is still witnessed by few to this day. This quiet village lies in the Swale between Sittingbourne and Chatham. Legend has it that a ghost haunts this pub in the High Street. It is thought by many to be the ghost of Charles Wilmot, the 3rd Earl ff Rochester (of the late 1600's) and was also seen by the former George Publican, William Busbridge in the late 1890's. A nearby Nunnery complained that Wilmot had seduced one of the Nuns after she returned troubled and upset. He was caught soon after and buried alive in the back garden of the pub as a punishment for his actions. This supernatural figure has been smashing glasses, scattering objects around the bar and frightening customers in Newington's ancient public house. One of the latest reports came in the Daily Mail in October 1982 when it reported the the ghost was again active. There is also a "Newington near Hythe" and a "Newington in Thanet." Your help is appreciated. The pub is now closed and is a residential house called "George House".